CSA Spring Pickup #1 – ugly food tastes better. This day could not come soon enough! I am SO glad that D and I had prepaid for a CSA share BEFORE we lost our jobs. At the very worst, we have a share of fresh fruit, veggies, eggs and flowers every Saturday through November, and THAT is something to be thankful for. This is also about the time last year that I decided to take the leap and start this blog, and I have had so much fun and learned so much since then. We got in the CSA early and were able to score a coveted Saturday pickup at the McCarren Park greenmarket, so we decided to go the extra mile, literally, this year, and get up early before pickup and walk a mile or so around the track at the park. This morning was grey and threatened to rain, but we forced ourselves out of bed and in to good walking shoes and headed out. We did almost 2 miles today, and then we were STARVING so we headed to the market. I will miss having the chalkboard pics that we had last year, BUT this year since I am not splitting the share with Lynn and Diego, I am very excited to not have to split the share, haha. Danielle and I are both such good cooks, and in such different ways, that this year should be very exciting recipe wise, and I have coerced her in to finally starting her own food blog, The Skinny Spoon! HOORAY STRAWBERRIES!!!! Garlic scapes! RHUBARB! sugar snap peas!!! Heaven! I am so glad that its finally CSA time! D and i could not get home and start cooking fast enough. She is health smoothie queen, and since the strawberries weren’t quite that sweet yet, she blended them with bananas, almond butter, usweetened almond milk and ice while I sauteed half a jalapeno, diced turkey ham, and a massive garlic scape in the last tablespoon of cilantro lime butter. 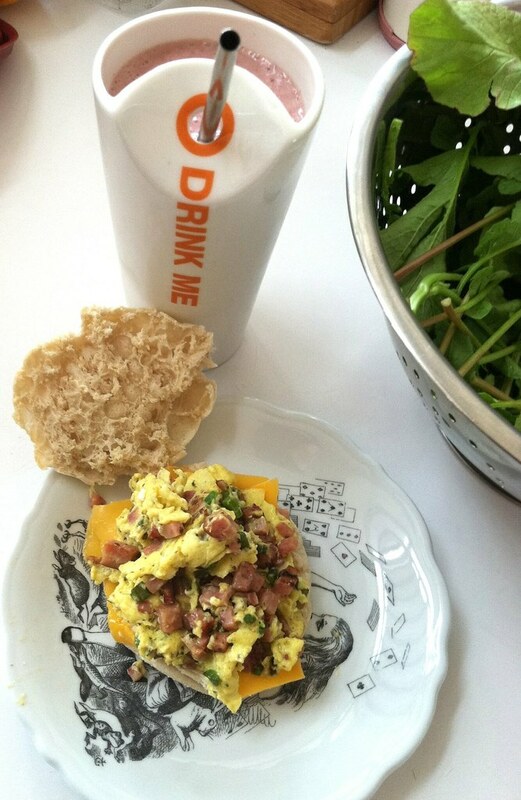 The half dozen eggs were very small, so I shook them all in my salad dressing shaker (makes fluffy eggs without adding milk) and make us a nice scramble on some toasted English muffins with some Cockonut Sauce . (DUH) YAY BRUNCH TEAMWORK! After we inhaled that, I decided to take a cue from Meg at work and make some radish top pesto while the leaves were all still nice and fresh. I cannot believe I EVER threw radish tops away. I feel so much shame that I have a hard time even admitting it to the internet! Pesto is great because it is fast, and it is easy. 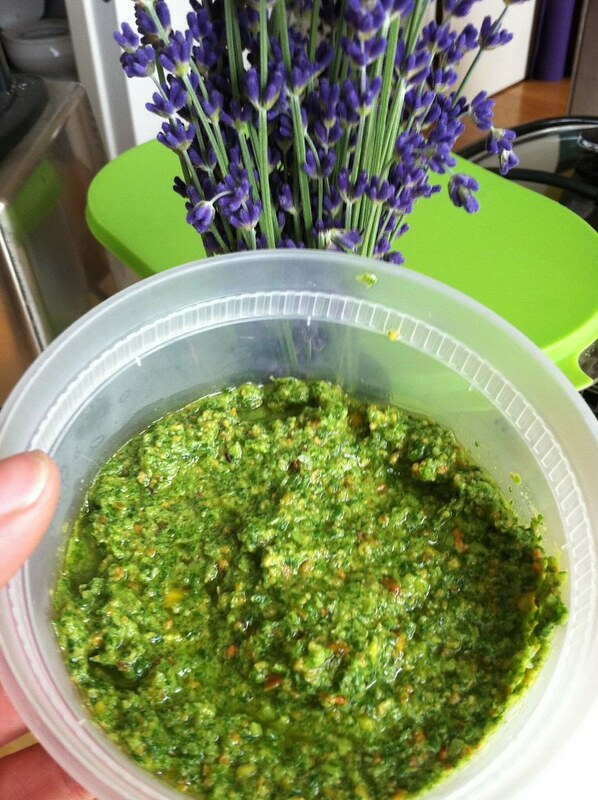 So instead of waiting for greens to wilt, go ahead and make some pesto, it will last and you will love it. This time around, I used walnut oil instead of olive, 2 garlic scapes instead of garlic cloves, and pistachios instead of hazelnuts. I LOVE subbing things out in pesto. You really can’t screw it up. Unless you add a ton of oil. That’s gross. We used a 1/4 cup for this batch. Often recipes call for a cup. You might as well deep fry your arm and call it a day. Not sure what we will do with this yet, but it is sure to be delicious, and I can’t wait to see what we get next week! 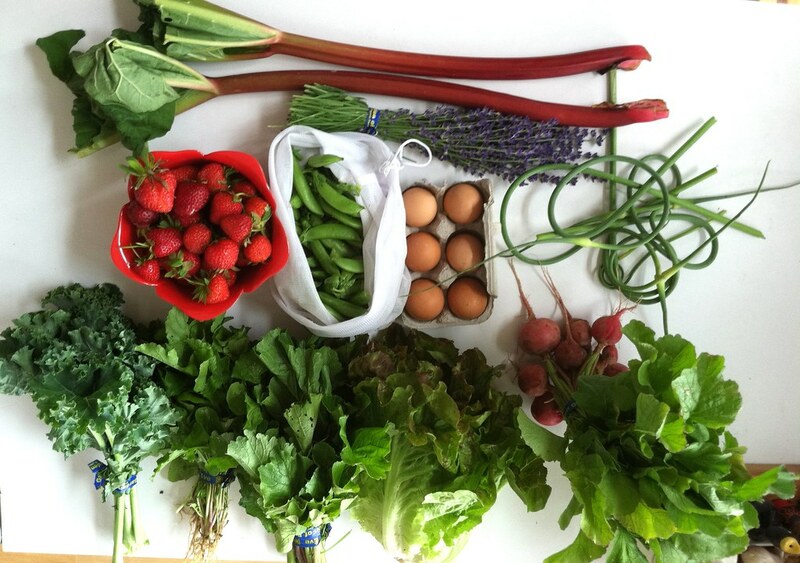 If you are looking for ideas with what to do with your CSA share, please join me on What’s in the Box? (Gwyneth Paltrow’s head!!!) where you can see what other people got in their CSA as well as what they did. That is good to know about the radish tops. It will be something I never throw away again. The pesto looks very tasty as did everything else. Good job! Thanks! Yeah I am still in awe of how delicious those tops are! Who knew!? I can’t believe I ever threw radish tops away either. Jeez, I was dumb! Looks like an outstanding haul. I love seeing what you are doing with it. Go CSA! Thanks for linking up! Looks like a nice variety of goods 🙂 And I am drooling over the breakfast sandwich…fluffy eggs…mmmm! I adore radish and carrot top pesto. Nice work and totally get what you mean about guilt. So you can do it with carrot tops too? I have heard a lot of people saying the only thing they are good for is making mouthwash…? I think I am not ready to be THAT efficient haha. Hey there! Found your blog on that link party site. I’m also part of a Garden of Eve CSA over in Carroll Gardens. I have to admit I spent a good hour yesterday reading through your posts, and really enjoyed them. YAY I am so glad to hear it! What a great CSA we have! What re you going to do with the rhubarb!? I am adamant about turning that into something savory, since I didn’t want to waste precious berries! I was thinking of doing some sort of gazpacho with it, or a chilled soup with avocado and yogurt. My roommate likes to make sweet and sour stir fry with it! I’m making her make it for me later this week! That sounds like a great idea! I will totally do that next time. I ended up making a relish/salsa which I’ve been using for omelets and for dipping with chips/crackers.